We know that The Necromancer has a big role to play in The Desolation of Smaug. But just how big will it be? Will Dol Guldur be a relatively minor affair involving only Gandalf and his fellow wizards? Or will other key actors of The Hobbit be somehow drawn into the struggle in the south of Mirkwood? In this feature, Ringer Captain Salt assembles what we know already form various actor blog posts, video logs and magazine articles and tries to tie it all together. The Dol Guldur storyline was only a minor portion of the first Hobbit film. Yet it set in motion things which will expand into a major story thread in The Desolation of Smaug after Gandalf leaves the company early on to deal with “some pressing business away south”. Just how will the Necromancer story play out in the second film? It appears this depends on how many of the other story lines are tied into that which most serves as a direct prequel to The Lord of the Rings. Bolg is the offspring of Azog the Desecrator — like his father, he is huge pale orc. He is the overseer in the dungeons of Dol Guldur — torturing is his hobby. He garnishes his armor with the bones and the blood of his victims. This husky Orc fears nothing and nobody — until he suddenly meets an unexpected opponent. 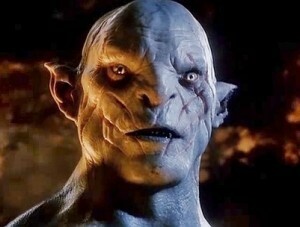 Azog — Sauron’s newest undead minion? There have also been hints that Azog is in service to the Necromancer — and may even have truly succumbed to his wounds at Azanulbizar and has been, well… necromanced… by Sauron. Might the re-use of the Nazgul motif during the Thorin/Azog confrontation at AUJ’s end, which Howard Shore collaborator and documentarian Doug Adams maintains was thematically appropriate, hint that Azog, like the Nazgul, is one of Sauron’s undead minions? Also as some have noted, during the final confrontation with the Gundabad Orcs Sting gleams brightly until Bilbo lands across the head of Azog’s warg, at which point the blade dims. Why? Because Sting recognizes that Azog is not a “living” Orc? And why is Bolg, himself a formidable Orc chieftain of the north in Tolkien’s writings, serving as Sauron’s interrogator? Does he owe the Dark Lord a debt for raising a slain Azog from the abyss? Despite many fans’ probable preference that Azog and Smaug remain independent agents rather than thralls of Sauron, the Bridge Direct description would not mention a connection between Azog and Sauron if there were not one. Additionally, in An Unexpected Journey Gandalf makes mention that he fears “the enemy” — meaning Sauron — could use Smaug “to terrible effect”. (As an aside, this actually ties closely with Gandalf’s thoughts on the importance of Thorin’s mission and the northern theater in Tolkien’s The Quest for Erebor as published in Unfinished Tales). And keep in mind that even before he had signed on to the project, but apparently after he had read the then-in-progress scripts, Ian McKellen mentioned that Peter Jackson and Co. had been quite clever about tying the various elements in The Hobbit together. The implication is that we would get a more cohesive narrative than the seemingly largely unrelated linear plot-lines that played out separately in An Unexpected Journey.